According to the new research report "Multi-mode Receiver Market by Platform (Fixed Wing, Rotary Wing), Fit (Line-Fit, Retrofit), Application (Navigation & Positioning, Landing), Sub-System (ILS, MLS, GLS, VOR/DME), and Region - Global Forecast to 2022", The multi-mode receiver market is projected to reach USD 1.21 Billion by 2022, at a CAGR of 4.76% from 2017 to 2022. 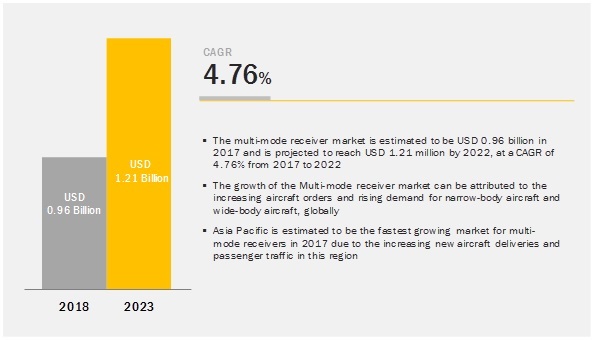 Increasing aircraft deliveries across the globe owing to the growing passenger traffic is is expected to drive the growth of the multi-mode receiver market. Browse 70 Market Data Tables and 44 Figures spread through 127 Pages and in-depth TOC on "Multi-mode Receiver Market - Global Forecast to 2022"
Based on platform, the fixed wing segment of the multi-mode receiver market is projected to grow at the highest CAGR from 2017 to 2022. Each aircraft is fitted with a multi-mode receiver that helps the pilot by helping in navigation, positioning, and landing of the aircraft. The increasing demand for narrow body and wide body aircrafts from different airlines is expected to drive the multi-mode receiver market. Based on fit, the retrofit segment is projected to witness the highest growth during the forecast period. The increase in the retrofit segment of multi-mode receiver market owing to the regulations that make multi-mode receiver a basic feature in any aircraft. Moreover, increasing retrofit activities in the retrofit market is expected to fuel the growth of retrofit segment of multi-mode receiver market. The multi-mode receiver market in the Asia-Pacific region is expected to grow at the highest CAGR during the forecast period. This anticipated high growth is mainly attributed to the increasing commercial and military aircraft deliveries of the region’s emerging economies, such as China and India. Furthermore, the rise in the air passenger traffic in these countries is also going to create a demand for more aircraft, which will, in turn, boost the for multi-mode receivers. The airspace modernization programs and adoption of satellite based augmentation system by various countries is going to drive the multi-mode receivers market in the coming years. Major players operating in the multi-mode receiver market include Honeywell International Inc. (US), BAE Systems plc (UK), Rockwell Collins, Inc. (US), Leonardo S.p.A. (Italy), and Thales Group (France), SAAB AB (Sweden), Intelcan Technosystems Inc. (Canada), Indra Sistemas SA (Spain), VAL Avioinics Ltd. (US), Systems Interface Ltd. (UK). These players offer different products used in applications such as navigation, positioning and landing. They also have well-equipped manufacturing facilities and strong distribution networks across the North American, European, and Asia Pacific regions. Don’t miss out on business opportunities in Multi-mode Receiver Market. Speak to our analyst and gain crucial industry insights that will help your business grow.